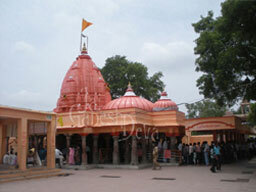 Chintaman Ganesh Temple is located in the city of Ujjain of Madhya Pradesh. It is an antediluvian shrine which dates back to 11th -12th centuries. This ancient temple is highly revered and is being regarded as one of the most visited shrines of Ujjain in Madhya Pradesh. This Chintaman temple is dedicated to Lord Ganesha who is considered as the Lord of beginnings as per the Hindu beliefs. In the traditional times of the country the Lord is known as 'Chintaharan', which literally means remover of all worries and tensions. This temple is thronged by crowds of people who come here to do away with all their worries at the shrine of the Lord. The term 'Chintamani' is another name known for Lord Vishnu, who is the preserver of the Universe as per Hindu Mythology. Inside the temple premises, the 'Garbhgriha' comprises the image of Lord Ganesha. The main scared shrine about this temple is that this idol is supposed to be 'swayambhu' (self-manifested), unlike other idols. The temple is adored by the two wifes of Lord Ganesha, namely Riddhi and Siddhi who are placed on the either side of the Lord. The temple is been embracing the idol of Lord Vishnu in its vicinity. This is the place where Lord Ganesha and Lord Vishnu are worshipped together with great devotion. The very appearance of the temple of Lord Ganesha suggests that it belongs to prehistoric times. Till today the temple has not lost its charm; in fact, it has become unique with its ancient origin. Chintaman Ganesh Temple boasts itself artistically carved pillars that are placed in the assembly hall. The age-old sanctity of the temple is preserved till date. The belief of the devotees for this shrine makes it all the more sanctified. People visit this temple, in large numbers, to get the graceful blessings of Lord Ganesha. The history of the Chintamani Ganesh Temple dates back to the ancient period when the people used to believe in the notion that the gods and he goddesses come alive on the earth for their purpose or to attend their follower's ardent prayers; from such a notion came the idea that the Lord Ganesh came into the earth and created the temple for himself in Ujjain is very popular. During Sagar Manthan, churning of the sea by the Gods and the Demons, Amrita or nectar came up from the ocean. One drop fell in Ujjain thereby making it sacred. Whosoever visits this place shall be filled with all the blessings of the Gods and Goddesses residing there.